I have purchased this brand of sheets only and have loved them for over 10 years, but something happened with my most recent purchase. When we initially pulled them out of the bag they were soft, silky, and luxurious just like the other two pairs we owned but not after washing them for the first time. They are stiff and feel like a completely different sheet set. In the past, our Wamsutta sheets always maintained their softness but not these and I am not sure what the difference is as I washed them the exact same way as our others. I am shocked and disappointed that I must rate these this way as I encourage everyone I know to buy bedding essentials from Wamsutta, but these are different and I can't understand why. I know they make great sheets but there is clearly something wrong with this most recent one we purchased. A truly bummed customer.. The towels were soft and plush. They were not overly soft, so they did not leave "fluff" everywhere. After two washes they look and feel new still. Color has not faded and seems that it is made to last. I love these sheets and won't bother with another. They are super soft, cut just right to fit on the bed, wash good and hold the scent of my laundry pods. It is such a nice set and totally worth every penny! I love the softness, they do wrinkle when washing but it's not a big deal for me as I'm using them for my bed. The elastic is nice and big and it fits the bed snuggly. The top sheet is a nice large size so there is pleanty of sheet on both sides of the bed more than the current sheets I'm using. Hope it lives up to lasting for many years. 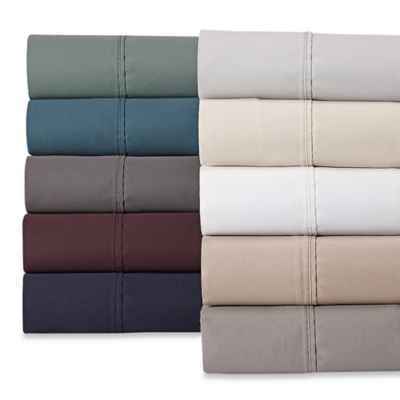 love the Wamsutta Dream Zone 725 Thread Count Sheet set! They literally feel like silk because of how soft they are! I like that the fitted sheet has extra room to fit any size mattress! These are the type of sheets I would find in a high end store! I am so impressed!